Guests are asked to arrive. Actor mingle with guests as you are asked to take a seat in the function room with head count. Starters are served, followed by several bursts of the show and the other courses being served. Actors will collect the evidence sheets. Winning team announced and Best Fancy dress prize awarded. Room to be vacated and carriages called. What happens when you cross a murder mystery with all the fun of a vibrant musical? 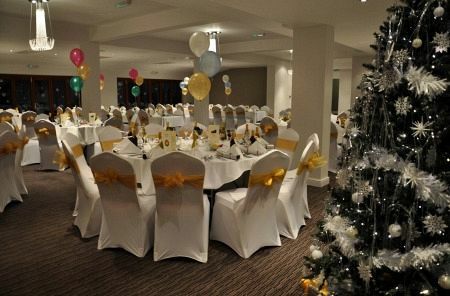 Well, you get a musical murder mystery night of course, and this incredible night at a top venue in Birmingham will promise you and your team one totally memorable Christmas celebration! With a selection of different musical murder mystery themes on offer this year, there will be something that everyone will love. From the fun filled Fawlty Towers themed 'Sybil Strikes Back', to 'Allo Allo' and 'Rodney's Revenge', you'll be in stitches as you try to solve the murder! New for 2019 is two new themed Murder Mystery nights; 'The Late Great Showman' and 'A Spoonful of Murder'. On the night, wear your smartest clothes and dazzle; alternatively, you could turn up in fancy dress if you really want to feel the part and get into the swing of things with this fantastic evening! During the night, everyone will enjoy a mouth-watering three-course meal from a seriously tempting menu. Table novelties and a 1/3 individual bottle of red, white or rose wine will also be provided for each guest. Alternatively, enjoy a bottle of beer or a J20 instead. Tea and coffee will be available at a self-serve station shortly after the dining experience. A disco will shortly follow the three-course meal, where you’ll be able to dance the night away to a brilliant array of top party tunes; you’ll want to make sure you’re wearing your dancing shoes on the night! The DJ will create the perfect atmosphere and will ensure that everybody’s having a great time! If work's too busy for you to celebrate in December, then why not organise your party night for January 2020 with the venue's brilliant 'Late Great Showman' murder mystery night which will take place on January 11th? This grade two property features complimentary parking for guests of the party and if there’s anyone within the group looking to use public transport on the night, then the nearest railway station is Birmingham New Street Station, which is just a short taxi journey away. Book your places for one of the venue's top musical murder mystery nights today and experience an unforgettable Christmas celebration with your team.